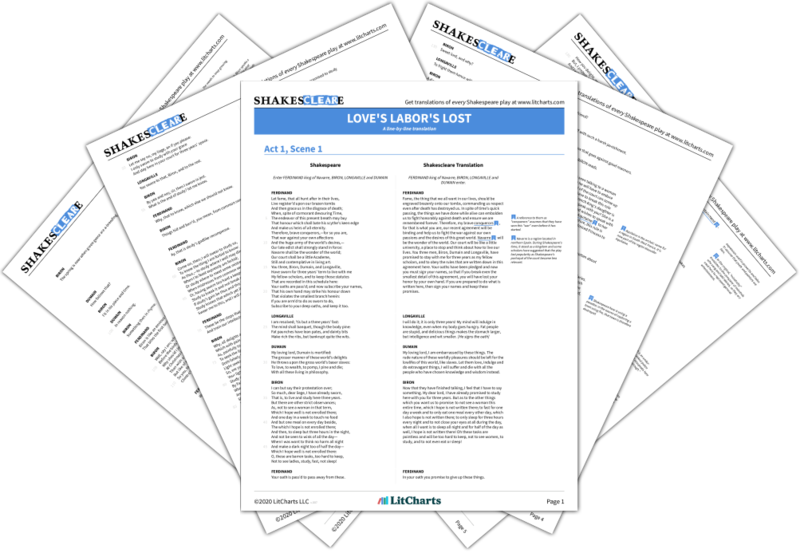 Welcome to the LitCharts study guide on William Shakespeare's Love's Labor's Lost. 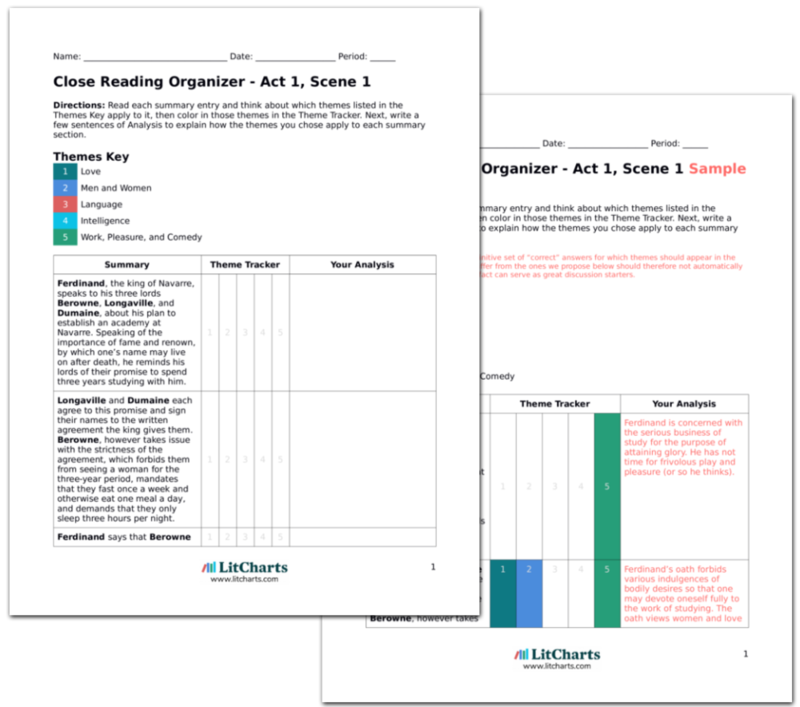 Created by the original team behind SparkNotes, LitCharts are the world's best literature guides. A concise biography of William Shakespeare plus historical and literary context for Love's Labor's Lost. A quick-reference summary: Love's Labor's Lost on a single page. In-depth summary and analysis of every scene of Love's Labor's Lost. Visual theme-tracking, too. Explanations, analysis, and visualizations of Love's Labor's Lost's themes. 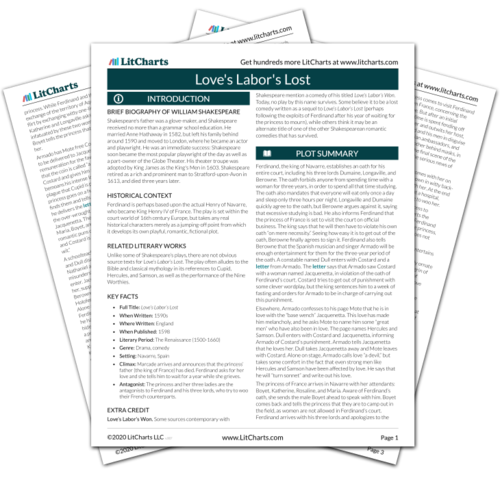 Love's Labor's Lost's important quotes, sortable by theme, character, or scene. Description, analysis, and timelines for Love's Labor's Lost's characters. Explanations of Love's Labor's Lost's symbols, and tracking of where they appear. An interactive data visualization of Love's Labor's Lost's plot and themes. Ferdinand is perhaps based upon the actual Henry of Navarre, who became King Henry IV of France. The play is set within the court world of 16th century Europe, but takes any real historical characters merely as a jumping-off point from which it develops its own playful, romantic, fictional plot. Unlike some of Shakespeare’s plays, there are not obvious source texts for Love’s Labor’s Lost. The play often alludes to the Bible and classical mythology in its references to Cupid, Hercules, and Samson, as well as the performance of the Nine Worthies. Climax: Marcade arrives and announces that the princess’ father (the king of France) has died. Ferdinand asks for her love and she tells him to wait for a year while she grieves. Antagonist: The princess and her three ladies are the antagonists to Ferdinand and his three lords, who try to woo their French counterparts. Love’s Labor’s Won. Some sources contemporary with Shakespeare mention a comedy of his titled Love’s Labor’s Won. Today, no play by this name survives. Some believe it to be a lost comedy written as a sequel to Love’s Labor’s Lost (perhaps following the exploits of Ferdinand after his year of waiting for the princess to mourn), while others think it may be an alternate title of one of the other Shakespearean romantic comedies that has survived. Fredericksen, Erik. "Love's Labor's Lost." LitCharts. LitCharts LLC, 3 Mar 2014. Web. 18 Apr 2019. Fredericksen, Erik. "Love's Labor's Lost." LitCharts LLC, March 3, 2014. Retrieved April 18, 2019. https://www.litcharts.com/lit/love-s-labor-s-lost.